In this guide, we'll focus on getting a WordPress instance set up with an Apache web server on Ubuntu 14.04. Before you begin this guide, there are some important steps that you need to complete on your server. We will be proceeding through these steps as a non-root user with sudo privileges, so you will need to have one available. You can find out how to create a user with sudo privileges by following steps 1-4 in our Ubuntu 14.04 initial server setup guide. Additionally, you'll need to have a LAMP (Linux, Apache, MySQL, and PHP) stack installed on your VPS instance. If you don't have these components already installed and configured, you can use this guide to learn how to install LAMP on Ubuntu 14.04. When you are finished with these steps, you can continue with this guide. The first step that we will take is a preparatory one. 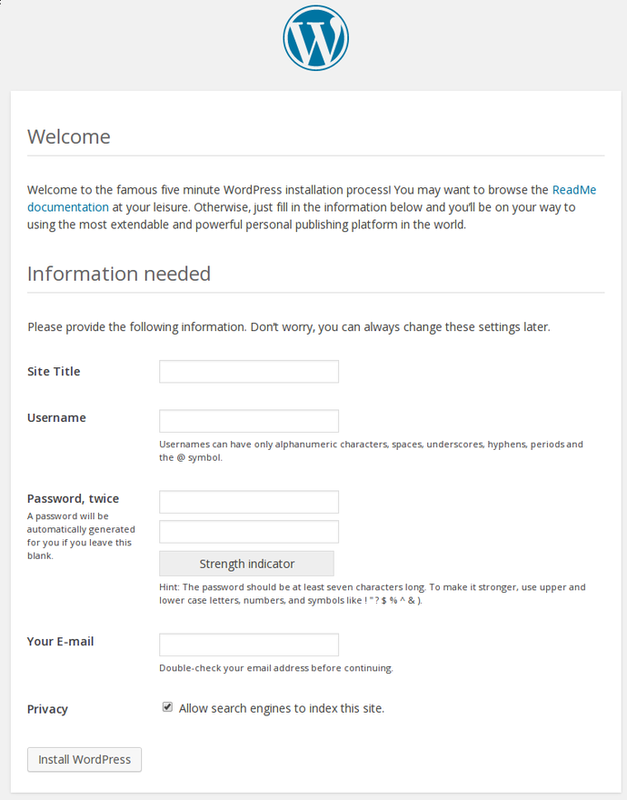 WordPress uses a relational database to manage and store site and user information. We have MySQL installed, which can provide this functionality, but we need to make a database and a user for WordPress to work with. You will be prompted for the password you set for the MySQL root account when you installed the software. You will then be given a MySQL command prompt. Every MySQL statement must end in a semi-colon (;), so check to make sure this is present if you are running into any issues. Next, we are going to create a separate MySQL user account that we will use exclusively to operate on our new database. Creating one-function databases and accounts is a good idea from a management and security standpoint. 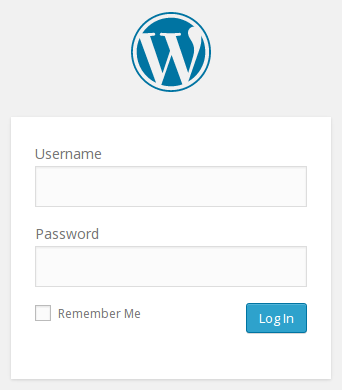 At this point, you have a database and a user account, each made specifically for WordPress. However, these two components have no relationship yet. The user has no access to the database. You should now be back to your regular command prompt. Next, we will download the actual WordPress files from the project's website. This will download a compressed file that contains the archived directory contents of the WordPress files to our home directory. 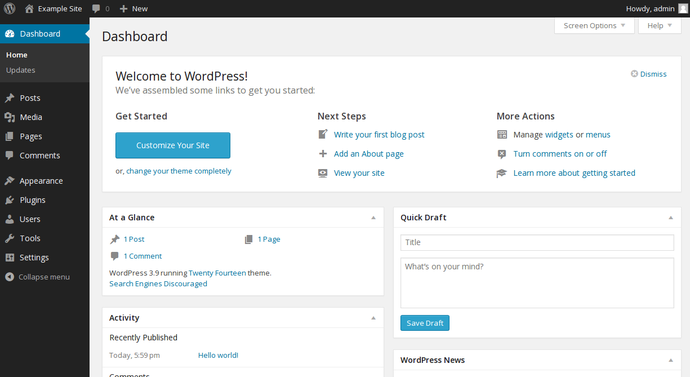 This will create a directory called wordpress in your home directory. This will allow you to work with images and will also allow you to install plugins and update portions of your site using your SSH login credentials. Most of the configuration that we will be doing will be through a web interface later on. However, we do need to do some work from the command line before we can get this up and running. As I said before, this file is almost entirely suitable for our needs already. The only modifications we need to make is to the parameters that hold our database information. We will need to find the settings for DB_NAME, DB_USER, and DB_PASSWORD in order for WordPress to correctly connect and authenticate to the database we created. These are the only values that you need to change. Now that we have our application configured, we need to copy it into Apache's document root, where it can be served to visitors of our website. One of the easiest and most reliable way of transferring files from directory to directory is with the rsync command. This preserves permissions and has good data integrity features. This will safely copy all of the contents from the directory you unpacked to the document root. You will need to change the ownership of our files for increased security. We want to give user ownership to the regular, non-root user (with sudo privileges) that you plan on using to interact with your site. This can be your regular user if you wish, but some may suggest that you create an additional user for this process. It is up to you which you choose. For this guide, we will use the same account that we set up during the initial server setupguide, which we called demo. This is the account I am performing all of the actions of this guide as. The group ownership we will give to our web server process, which is www-data. This will allow Apache to interact with the content as necessary. This will set up the ownership properties that we are looking for. While we are dealing with ownership and permissions, we should also look into assigning correct ownership on our uploads directory. This will allow us to upload images and other content to our site. Currently, the permissions are too restrictive. This will allow the web server to create files and directories under this directory, which will permit us to upload content to the server. Now that you have your files in place and your software is configured, you can complete the installation through the web interface. Fill out the information for the site and the administrative account you wish to make. When you are finished, click on the install button at the bottom. This isn't exactly the most useful interface for visitors or search engines, so most users want to modify this. WordPress has the ability to create "pretty" permalinks which will clean up the URL into a more human-friendly format. There are a few things we need to do to get this to work with Apache on Ubuntu 14.04. 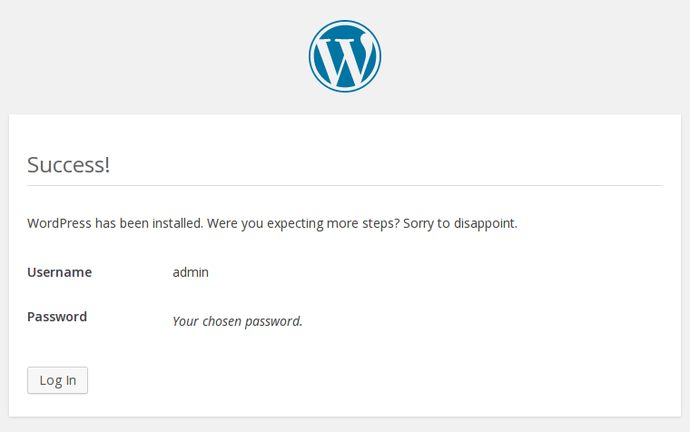 First, we need to modify the Apache virtual host file for WordPress to allow for .htaccessoverrides. You can do this by editing the virtual host file. Now that Apache is configured to allow rewrites through .htaccess files, we need to create an actual file. We now have the correct ownership of this file. We may need to adjust the permissions however. This depends on how you prefer to work. WordPress will generate the necessary rewrite rules for you. If it has write permissions to this file, it can implement the rules automatically. If it does not, you will have to manually edit this file to add the correct rules. Which configuration you choose depends on how much you value convenience over security. Allowing the web server write access to this file will definitely be more convenient, but some say that it is an unnecessary security risk. 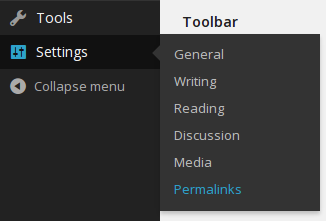 When you are finished doing the server-side changes, you can easily adjust the permalink settings through the WordPress administration interface. You can choose any of the preconfigured settings to organize URLs, or you can create your own. When you have made your selection, click "Save Changes" to generate the rewrite rules. If you did not allow the web server write access to your .htaccess file, you will be provided with the rewrite rules you need to add to the file manually. This should give you the same functionality.